We were contacted by our good mates over at McFaul studio asking us to take part in a event there curating with clothing brand howies. 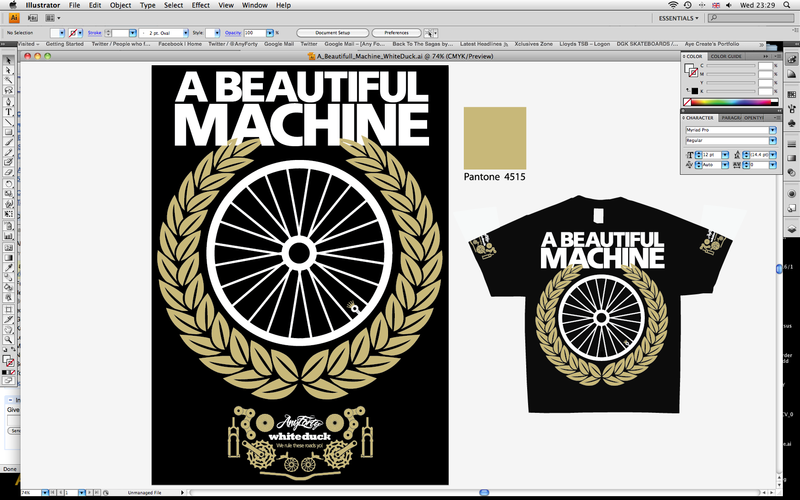 The brief was to design some artwork that contained the phrase “A Beautiful Machine” and had something to do with the thing we all love, bicycles. The Artwork is to go on display and will be sold of, with all procedes going to the Haiti fund. The art work could be any size and the only rule was the finished piece has to be printed and framed. As we’re trying to run this streetwear tee game thought it’d only be right to design a 1 of 1 tee and get it framed and hung in the howies bristol gallery for the event. The tee will be finished to our normal high standards, complete with swing tags and neck tags. We cooked up this simple, yet punch graphic tee in partnership with White Duck Screen printing, we designed the tee tonight and there working there magic and printing it up for us tomorrow. That’s how fast we both work! Check it out below. Went for a metallic gold and white print, with chest graphic and sleeve details. A Beautiful Machine is a two week event curated by John McFaul/McFaulStudio and howies, at the howies Bristol store. Its remit is purely and simply to inspire. It will launch on Friday 26th March and end on Friday April 9th and during that fortnight will include 5 evenings of talks, one bicycle treasure hunt on the first weekend and the possibility (it will happen) of a critical mass meet on the last sunday. There are 80 or more artists involved from around the Globe and 15 amazing speakers at this time. We have a blog about to go live week beginning Monday 8th, twitter, Vimeo and Flickr all ready to go. All artwork will be for sale and each of the evening talks ticketed at £5. All money will be going to Save the Children – Haiti Earthquake Appeal. This entry was posted on March 17, 2010 at 11:45 pm and is filed under Any Forty. You can follow any responses to this entry through the RSS 2.0 feed. You can leave a response, or trackback from your own site.